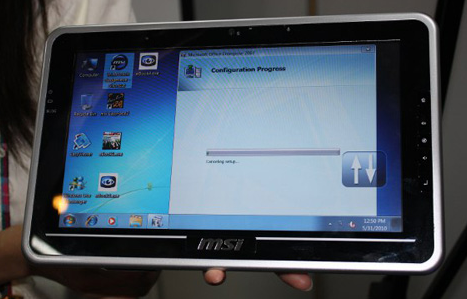 Conventional users get the Wind Pad 100, a full Windows 7 tablet with a 1.66GHz Atom Z530, 2GB of RAM and a 32GB solid-state drive. The Wind Pad 110 switches to a dual-core NVIDIA Tegra 250 with Android operating system. Besides their internals, the two vary sharply in hardware and software. The 100 has a customized, touch-friendly layer to support Microsoft’s normally desktop oriented OS; it should carry netbook-like expansion with HDMI video out, a webcam and two USB ports. The 110 should have just one USB port but will be more stylized and should have swappable back plates to change the look. MSI should ship the Wind Pad 100 by the end of the year for $499 but is less than clear on what it will do with the 110. If it ships, it may also arrive by the end of the year but would cost $399, reports Electronista.